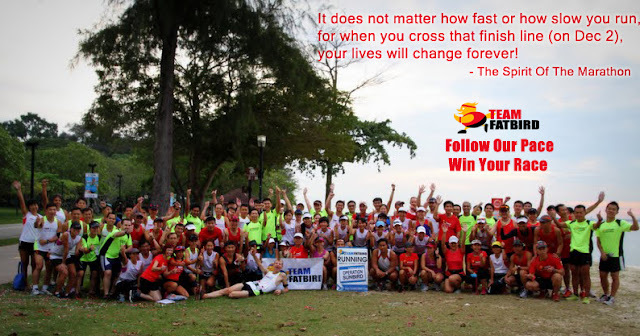 Facebook Photos from FatBirds Chin, Ronnie. And there we were, after 11 weeks of intensive but progressive buildup of endurance and pace strength, with a journey through hills, slopes, trails, tarmac and park connectors with a flock of wonderful runners and trainers – The Sunbird Team. This is where it all comes down to…a finale tapering LSD of 40% of the actual marathon distance at the Optimal Pace we have set out for our team. 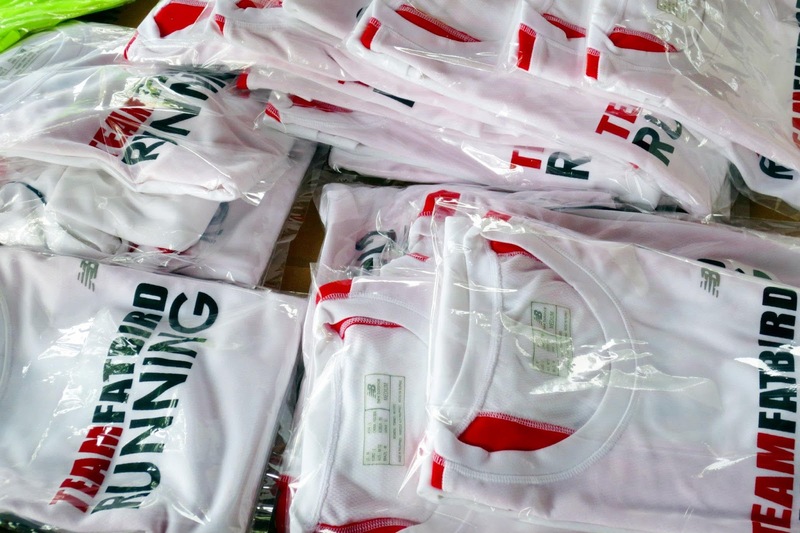 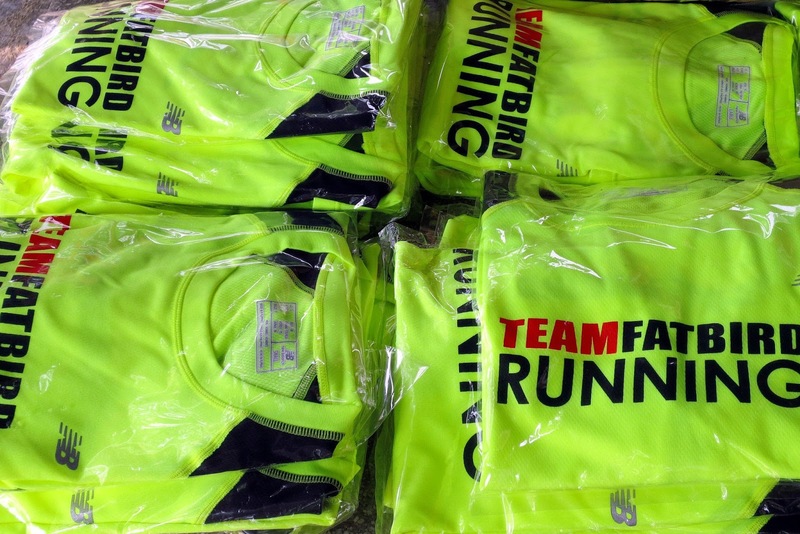 Decked out in the Sunbird training and finisher tops, we were back at the FatBird Playground for “passing-out” photos and catching up. 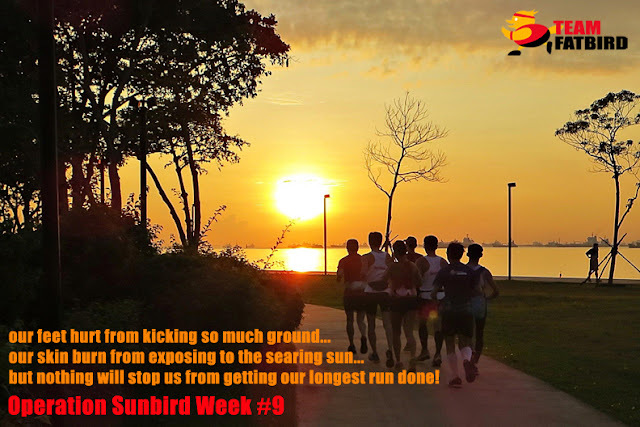 As the Sunbirds took their final LSD pre-race flight along the east coast parkway, there was an air of confidence in their strides and paces as they ran in their respective group formations led by the steady wings of the training crew. 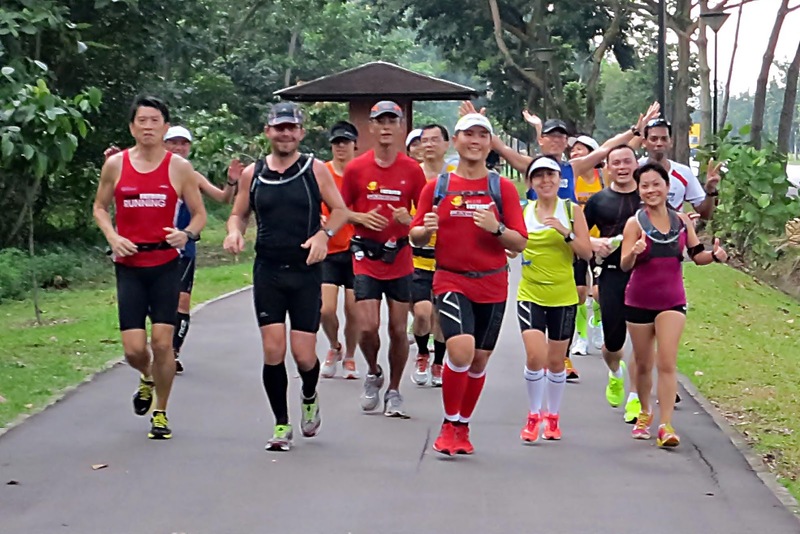 It was a joy to see the Sunbird trainees, who have come quite a distance (no pun intended) in terms of building strong foundations and improvements to our abilities to tackle the marathon with confidence, with the know-how to complete the challenge within targets. All the groups completed their run with well-controlled optimal paces, field-testing their race-day gear and equipment, including hydration and fuel plans which will be important to their ability to complete the mission objectives. 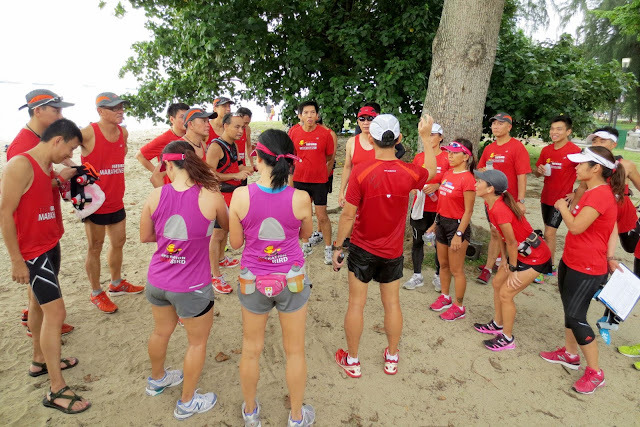 The flock gathered for a debrief and some final tips for race day, before going their separate paths in mini sections for their post-run meals. 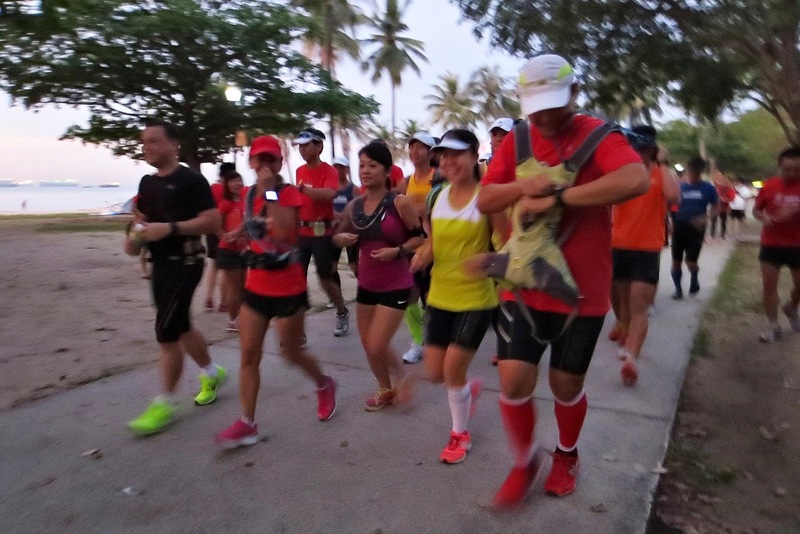 Although there were a few trainees who were still nursing minor injuries, the team was 90% fit and at REDCON 2. 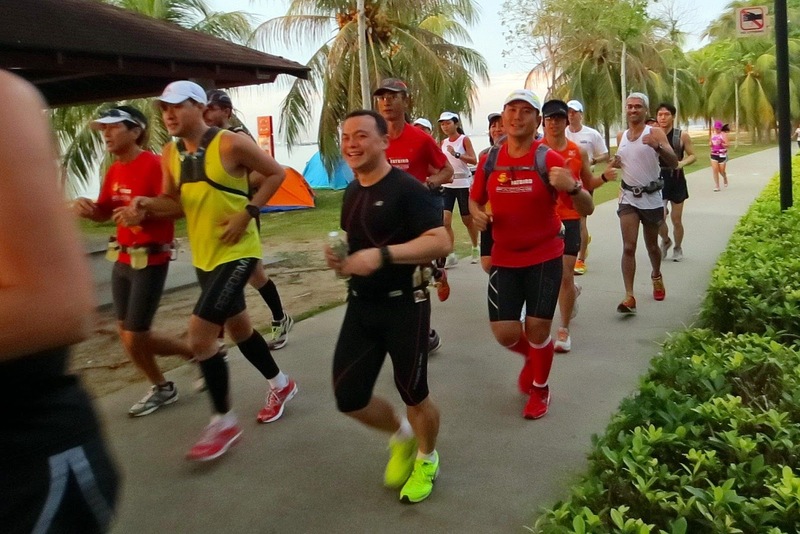 The remaining few days of proper rest and nutrition will be key to rev up to REDCON 1 by race day. 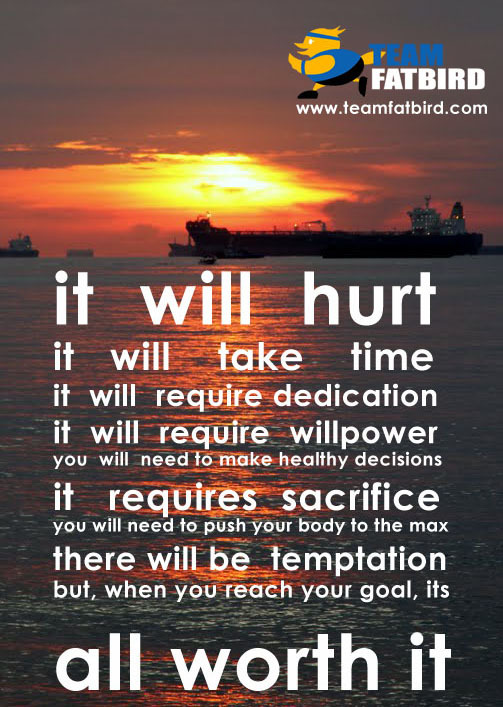 The Sunbirds Are Race Ready – Follow Our Pace, Win Your Race! 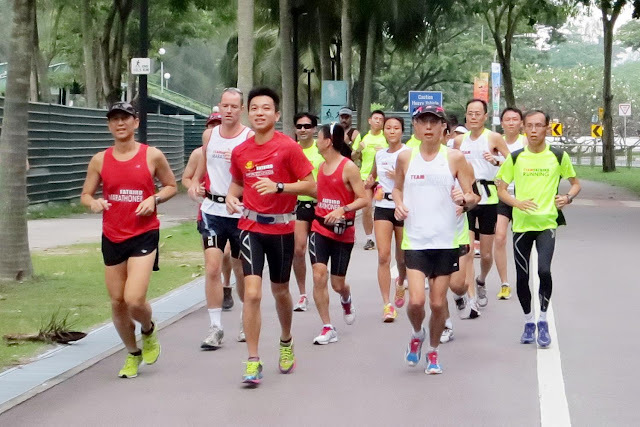 With 3 weeks left to the Standard Chartered Marathon Singapore (SCMS), the Sunbirds were scheduled for the longest Long Slow Distance (LSD) run in our preparations for the marathon – distances at marathon race pace – 22km for the HM and 35km for the FM groups. 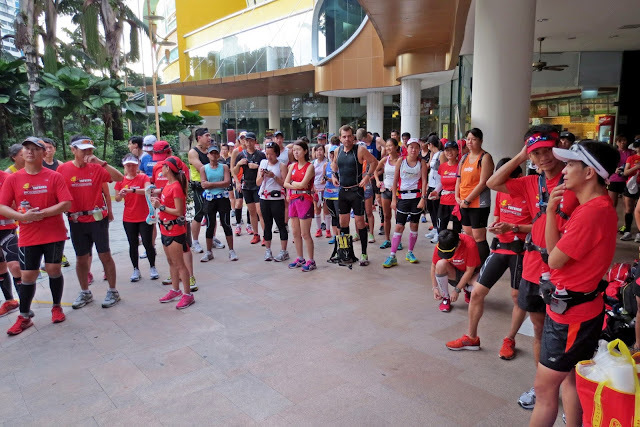 We started earlier at 6:30am with a very quick briefing, before flagging the different pace groups off in the direction of Changi Coastal Road. 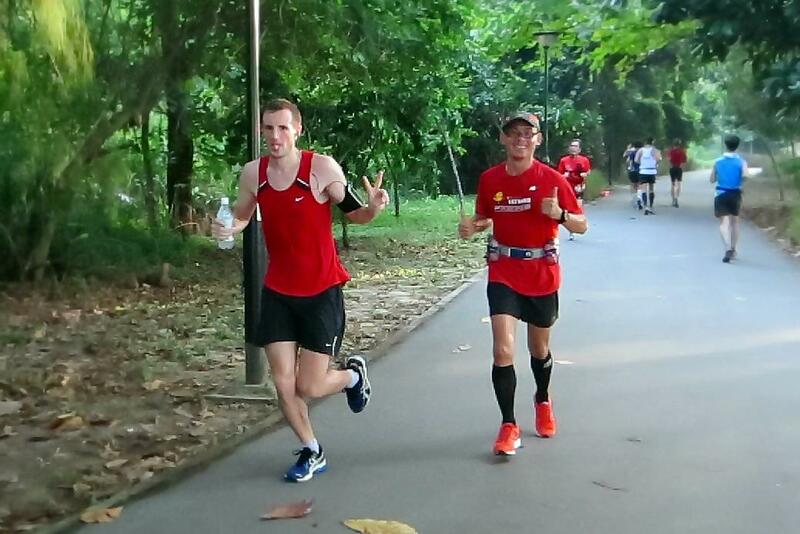 The pace groups led by their respective pacers went on steady target paces for most of the first 21km. 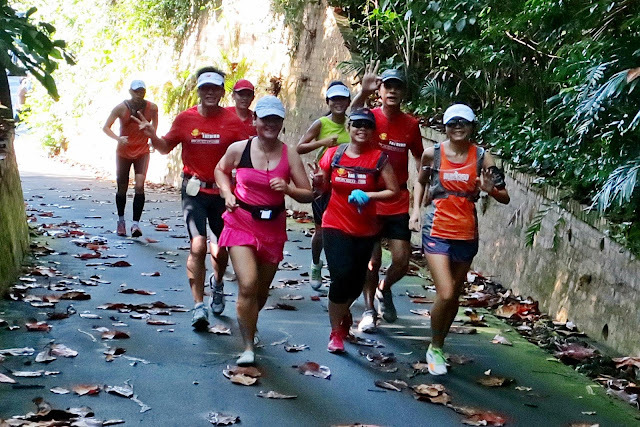 Because of the Passion Run also happening in the vicinity, there were a few crowded points when we returned from Coastal Road after 23km, although we had pretty smooth access in the first half of our run. 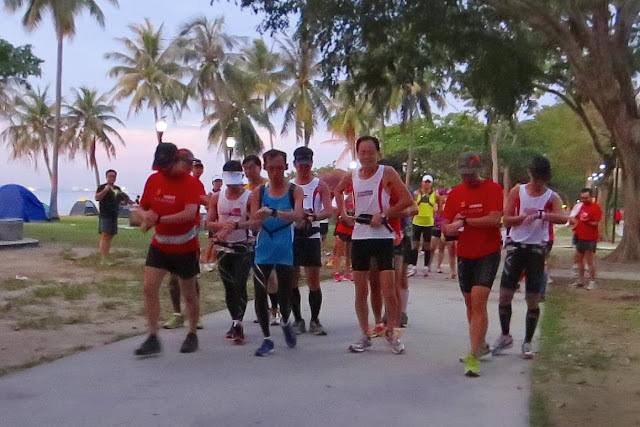 The Sunbirds were advised to take a more cautious approach, adopting more sustainable and measured paces for at least the distances up to 30km – to do a trial test of the sustainable marathon pace each trainee can maintain. 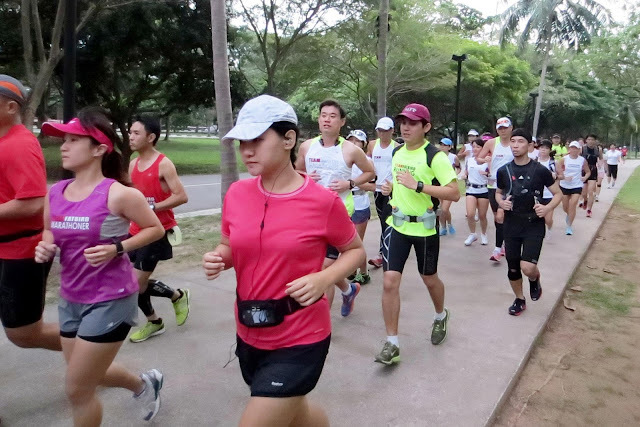 On race day, it will be every Sunbird will be self-sufficient in doing their own paced marathon, using the marathon pacers more as guideposts rather than be too reliant on them to provide the paces throughout. 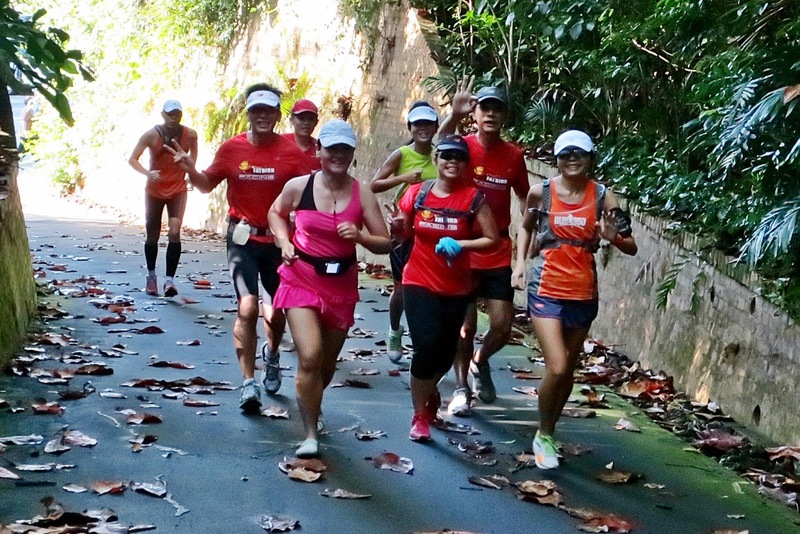 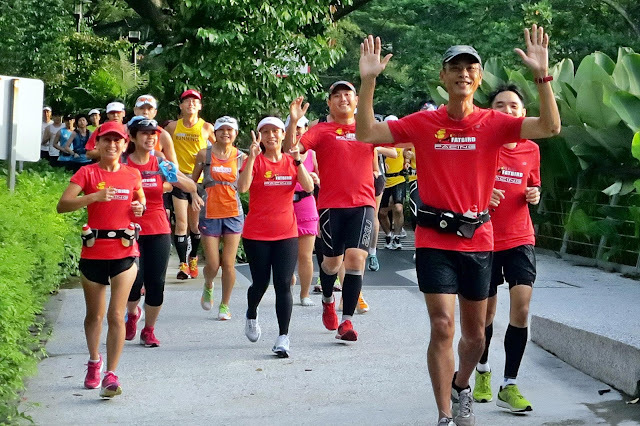 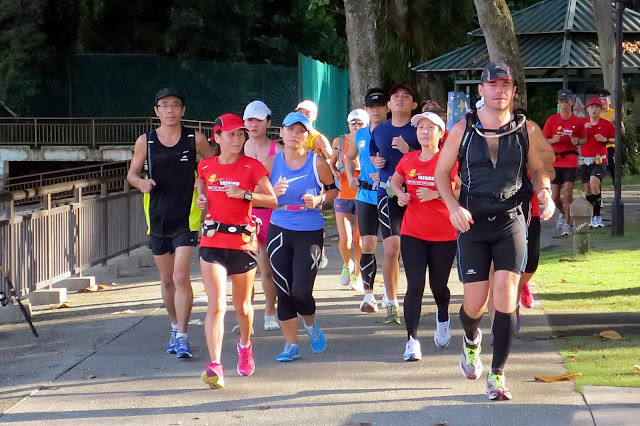 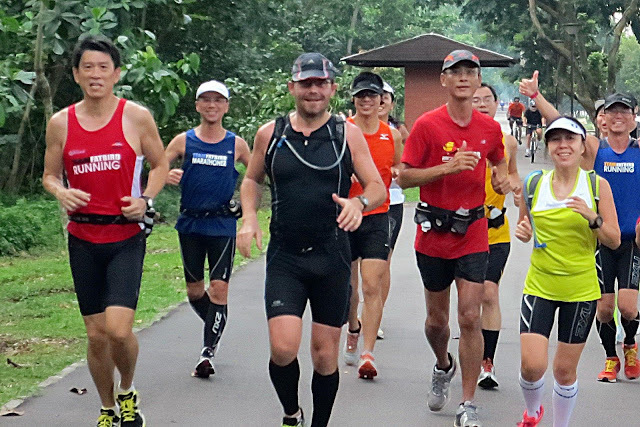 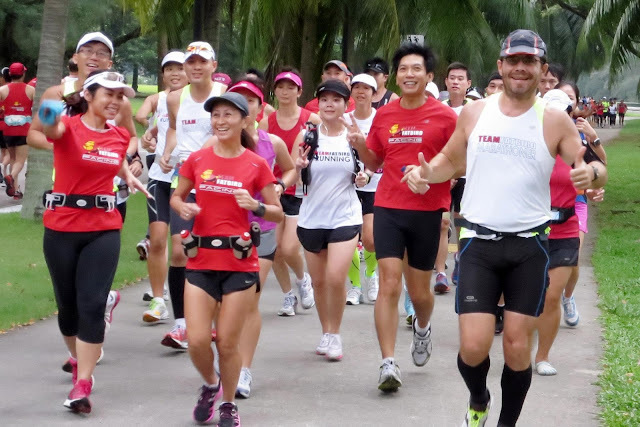 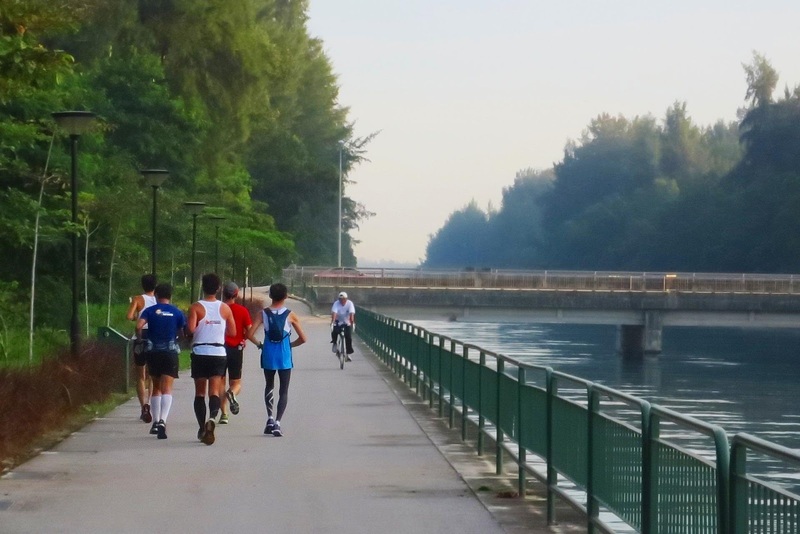 In spite of the seriousness of the training, there were lots of chatter and laughter which actually helped the runners to ease into the target zones and melt the km away, especially on the ‘mentally challenging’ Changi Coastal Road stretches. There were ample opportunities for hydration and fuel replenishment practice. 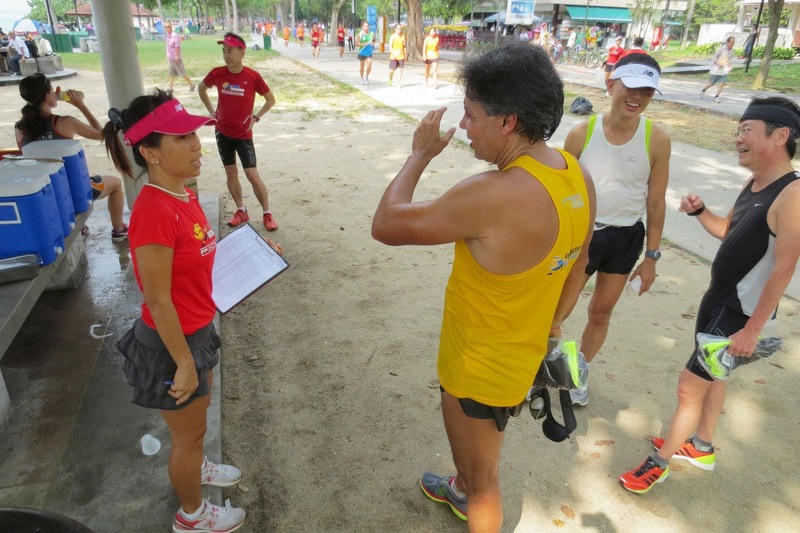 The heat of the mid-morning sun drove many Sunbirds to the toilets for top-ups and wash-downs to their heads and bodies – the heat was so intense at some points that we could feel the burning sensation on our bare skin. 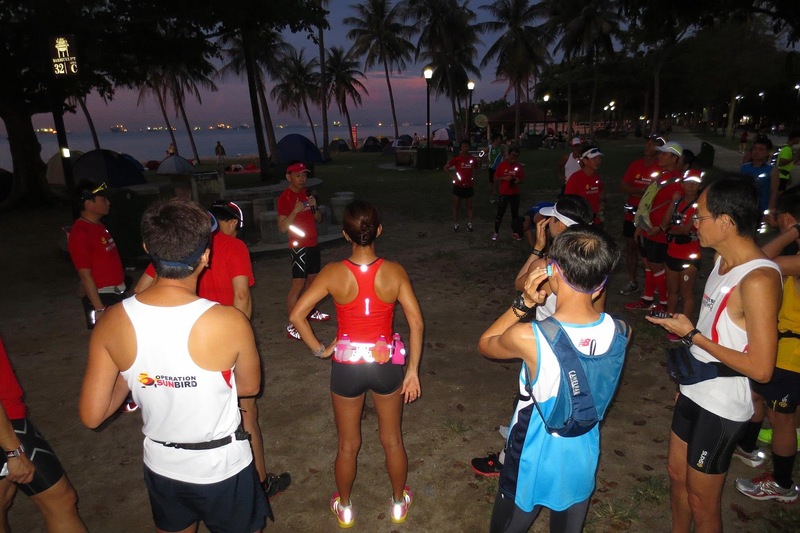 The HM groups had no problems fulfilling their tasks in spite of having to weave amongst the thick crowd of Passion-ate runners. 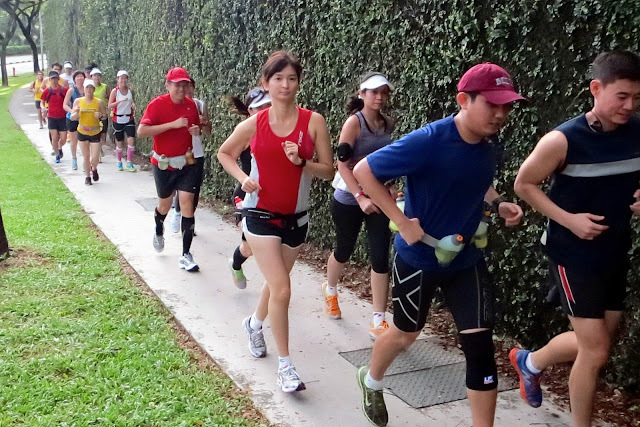 The FM Sunbirds met the wall from about 25-28km, when the sun was beating down on us furiously…what with a very warm morning. 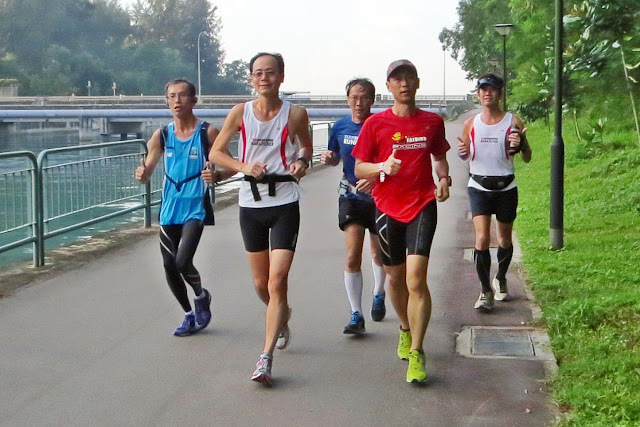 By the time we reached back to C4 having covered 29km, we were real spent. 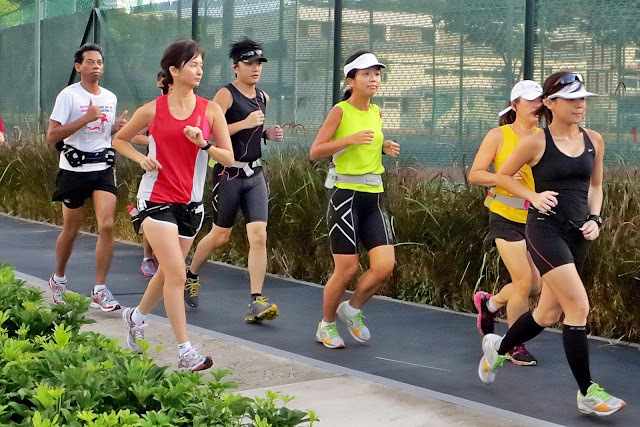 However, many of the FM Sunbirds continued on towards Playground @ Big Splash in spite of their tired legs. 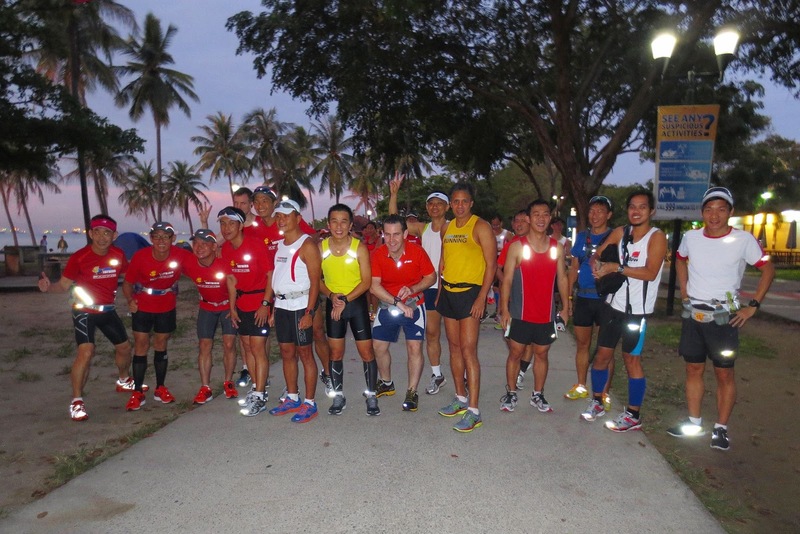 Such was the mental strength and commitment to finish the mission, which distinguishes the Sunbirds from casual runners. 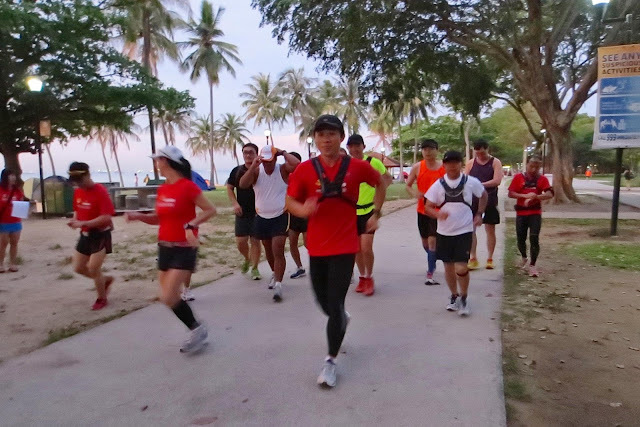 It helped that the cloud cover came on subsequently, and with the isotonic hydration replenished, many of the trainees went on to complete 33-36km of paced training. 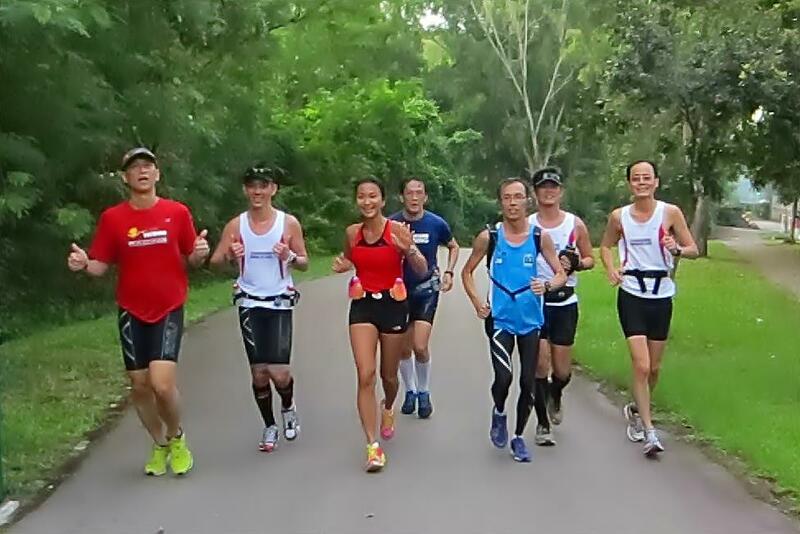 The mental attitudes of the trainees were indeed strong….and knowing that it was final longest run before tapering begins, many just pushed on (within safety limits) to accomplished the admirable feats of distances. 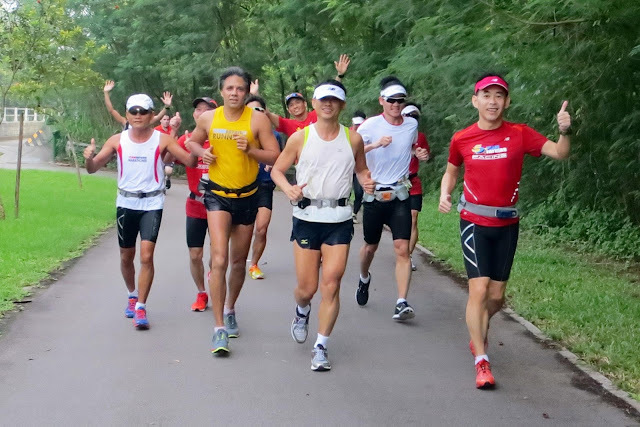 The Sunbirds completed the longest training run at pace well within regulation time, and many were so happy that they stayed on much longer than usual to share experiences with one another, checking with the trainers on preparations and rest and recovery tips to keep their trained engines in good condition for the race on Dec 2. The Sunbirds have shown they are up to the task at hand, and with many having very good shots at meeting their set marathon objectives, we are looking at a good outing at the SCMS race. 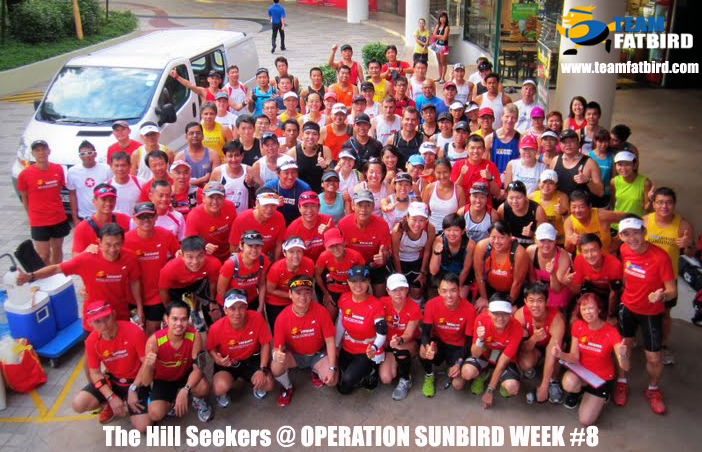 Operation Sunbird – Follow Our Pace, Win Your Race!